. . . And on the 11th Commandment, she rested. Pardon the mixed metaphor here, but Liz Weston’s new book, The 10 Commandments of Money, is simply jam packed with information, websites, names, do’s & don’ts. In fact, it is so exhaustive that I assumed she was exhausted by the time she finished writing this 292-page tome. • The New Rules: what she is recommending we follow moving forward. The majority of her “Rules” are good, common sense. In fact, the entire book is primarily based on sound, logical principles that everyone should have learned at some point in their lives. Ms. Weston does bring up a critical point in her book that a few others have stated and still more will echo in the future: In the U.S. we need to help everyone attain financial literacy. To be as advanced a society as we are in so many ways and to have so many people really not understanding the fundamentals of accounting (balancing a checkbook), economics (compound interest), and finance (cash versus debt) is simply unacceptable. Now this is different from people knowing these things and still acting silly anyway. Many people who were well educated and experienced in these fields, including our major bankers, regulators, and ratings agencies, acted as if they didn’t understand the rules. They certainly should have. 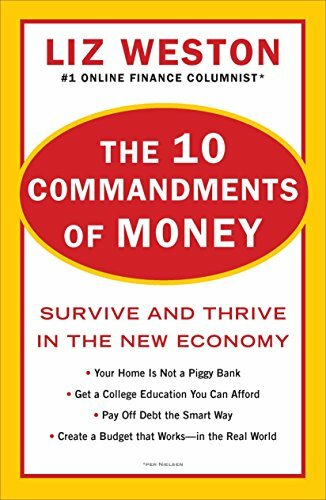 But getting back to the main audience for this book, the typical American consumer, The 10 Commandments of Money focuses on the 10 major financial (money) categories the author feels are important. One has to wonder if she believes there is a relationship between the order of the Commandments and her concern about their relative importance. Each chapter includes the three Rules, referred to earlier, as well as Insider Terms. These are expanded definitions of words or phrases used regularly in conversations regarding economics and finance that everyone should know. Many people use these terms frequently without necessarily understanding their meaning. And herein lies part of the problem: Everyone needs to know these terms since they impact the decisions we make about how we spend the money we have. Without understanding these critical terms we are underprepared to make the best decisions for ourselves—and therefore frequently do not. One of the most important chapters is #1: Create a Budget That Works in the Real World. It seems most people know they should have a budget, but don’t. Further, most people who have a budget don’t stick to it. Bad idea. A budget is a tool to help us decide how we are going to spend the money we have available. Without a budget we don’t even know how much money IS available and so we spend blindly. Sometimes too much and sometimes on the wrong things. In her second chapter, Create a Survival Plan with Cash and Credit, she gets into discussing not only handling cash but understanding our credit score. This is critical in today’s world and so few people even understand the score let alone know what to do to improve it. A few of her suggestions to generate more income/cash in this chapter are a little “out there,” but the idea of being a little creative instead of giving up is on track. In many of the chapters Ms. Weston provides a list or sequence of suggestions that, if followed, can put her principles into practice. Generally, if the reader follows this advice they will be on a more enlightened financial path. The chapter on Pay Off Debt the Smart Way is an interesting one. Fundamentally, her suggestions are completely workable, even practical; however, experts across the country differ on what is the best way to pay off debt. Should one pay off the largest debt first to have the greatest impact? Pay off the smallest to have a quick “win”? Pay off the one with the highest rate to minimize the interest expense? There is no one right answer. Knowing the risk and rewards of each is how one makes the right choice. One of the most impressive elements of The 10 Commandments of Money is the periodic insertion of deeply researched economic data to support the author’s position. In the chapter on Risk she shares specific data from 1926 forward on the S&P including blocks of good returns and not so good returns. She further illustrates the point by showing portfolios with various mixes of stocks and bonds and how they fared over time. One of the more interesting positions is her chapter on Get a College Education You Can Afford. So many of us were brought up with the idea a college degree was imperative. While she does agree that most people need at least some college, she does say that we need to think about what we can afford, start planning early, and even have specific discussions with our children to set their expectations. Too many people sacrifice too much to get what they think is an educational key to success only to find they can’t reach the door due to the heavy debt burden they will carry for many years. Finally, her chapter on insurance explains three very important points. First, insurance is transferring catastrophic risk to a third party for a fee. We should not pay a fee for risk we are willing and able to take on ourselves. Second, get the right type of insurance for your needs. Third, understand what you are buying. All in all, this book is a fact-filled, commonsense approach to dealing with the everyday money issues we all need to address. When it comes to money we need to approach it like we learned to cross the street: Stop, look left; look right, look left again, and then proceed only when safe.